As Chairman Emeritus of The Batchelder Company, William G. Batchelder brings a wealth of knowledge in state government and an unmatched historical perspective to the firm. He provides key insights and strategic guidance in both public policy and political arenas. William G. Batchelder has a long and distinguished career in state government, finishing as the second-longest serving member of the legislature in Ohio history with 38 years in the Ohio House. First elected in 1968, Batchelder spent 30 years in the Ohio House before leaving to become a judge for the Medina County Common Pleas Court and a judge on the Ninth District Court of Appeals from 1999 to 2005. Upon his return to the legislature in 2007, Batchelder served as Chairman of the House Insurance Committee before being elected as Minority Leader by his peers. During his final four years in office, Batchelder was elected as Speaker of the Ohio House, the highest and most prestigious position in the legislature. Speaker Batchelder was responsible for leading the House Republican caucus to a record setting 65 seats, the most seats held by a majority in modern Ohio history. Term-limits forced Speaker Batchelder to retire from the legislature at the end of 2014. Speaker Batchelder has established a long career in practicing and teaching law. He spent 31 years of his professional career at the Williams and Batchelder Law Firm in Medina, Ohio, while also serving as an adjunct professor of law at the University of Akron Law School and as an adjunct professor at Cleveland State University Levin College of Urban affairs. In 2015, Batchelder returned to teach law at Cleveland State as well as teach at the Ray C. Bliss Institute of Applied Politics at The University of Akron. 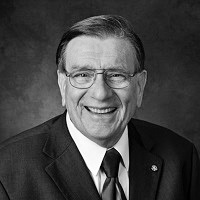 Over his career, Speaker Batchelder became known for his great oratory skills, his extensive understanding in parliamentary procedure and the legislative process as well as his unmatched knowledge of the Ohio Revised Code. A man of integrity and unrivalled work ethic, Batchelder became an expert of the law in numerous areas including banking, insurance, public utilities, school choice, public pensions and the criminal code. Speaker Batchelder graduated with a bachelor’s degree from Ohio Wesleyan University in 1964, as well as a Juris Doctorate from the Ohio State University College of law in 1967. He currently resides in Medina, Ohio with his wife, Alice. They have two adult children and seven grandchildren. As Senior Advisor at The Batchelder Company, Jim Buchy brings more than five decades of experience in business leadership and development coupled with public service and policy experience across many sectors of government. He provides a keen sense of direction and determination in projects across the board. The former President and CEO of Buchy Food Service, has held numerous leadership roles within the Ohio Legislature. Buchy served in the Ohio House of Representatives from 1983 to 2000 and again from 2011 to 2016. When he was not in the legislature he held a key position at the National Federation of Independent Business after he was the Assistant Director of Agriculture in Ohio from 2001 to 2004. Most recently, former State Representative Jim Buchy, has devoted his attention to an organization focused on improving access to agricultural education for young people. His dedication seeks to increase the number of young people working towards a career as an agricultural educator and exposing urban youth to the values of a life associated with the agricultural industry. For his service to Ohio’s agricultural related industries, he appreciates the honors of being named to the Little Brown Jug Wall of Fame, the Ray Prowant Memorial Award from the Greater Ohio Showmen’s Association, the Beef Industry Service Award from the Ohio Cattlemen’s Association, the Rambling Willie Award from the Ohio Harness Horsemen’s Association, numerous Honorary Chapter Degrees from local FFA Chapters and an Honorary State FFA Degree from the Ohio FFA. In addition to his strong focus on agriculture issues, Buchy has made an impact on tort reform, improving our elections systems and small business concerns. He successfully led the legislative effort to reduce testing in Ohio’s schools, returning control to local boards of education. Fitting for a public servant who began his public career on the Greenville Board of Education in 1980. Jim Buchy is active with a number of charitable and non-charitable organizations in his native Greenville where he graduated high school in 1958, prior to earning a Bachelor’s Degree from Wittenberg University. He and Sharon reside in Greenville where they enjoy the company of their two grown children and many grandchildren and their first great grandchild. They are members of St. Paul Lutheran Church. As co-founder of The Batchelder Company, Troy brings over a decade of experience in public policy and political campaigns to the firm. Previously, Troy served as Senior Political Advisor to Speaker William G. Batchelder and the Ohio House Republican Organizational Committee (OHROC) where he helped win a record 65-34 seat majority. He also held senior leadership positions in the 2010, 2012 and 2014 campaign cycles, taking the caucus from a 46-member minority to 65-member majority. Prior to his most recent role at OHROC, Troy served as Chief of Staff of the Ohio House of Representatives from 2009-2014. On behalf of Speaker Batchelder, he was responsible for overseeing all departments and operations of the House which employs over 230 employees and maintains a $20 million annual budget. Troy holds a bachelor’s degree from The Ohio State University. A northeast Ohio native, he grew up as an unwavering Cleveland sports fan. As co-founder of The Batchelder Company, Chad brings over a decade of extensive experience in researching, developing, and implementing public policy at the state government level. Chad’s growth within the Ohio House of Representatives lends him a unique and unrivaled perspective in the legislative process. Chad served as the Director of Policy from 2009-2014 in the Ohio House of Representatives under the guidance of Speaker Batchelder. Tasked with being the top policy advisor for members of the majority party, Chad worked daily with policy staff from the Governor’s office, President of the Ohio Senate and other statewide officeholders as important policy issues were drafted, debated and passed into law. Chad also served as Chief of Staff to Speaker William G. Batchelder for his final year in the Ohio House. In this role, Chad helped see through several important projects that were completed prior to his departure in the House, as well as helped the majority party navigate several complex issues in the lame-duck session. Chad holds a bachelor’s degree from The Ohio State University. A native of Zanesville, Ohio, he is a life-long Cleveland sports Fan.